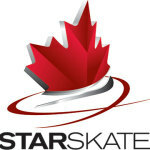 STARSkate encourages skaters to develop more advanced figure skating skills in various areas such as Skating Skills, Free Skating, Dance and Interpretive Skating. 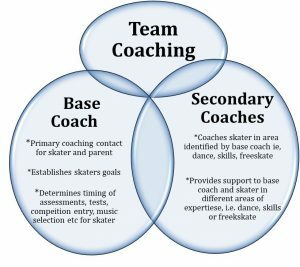 It provides figure skating instruction in group and private lesson format. The program assesses the skaters’ progress through optional Skate Canada tests completed by coaches at the beginner level and by certified judges at higher level skills. The program challenges skaters in a competitive environment through competition and encourages skaters to keep participating in skating for fun, fitness and achievement. Skating Skills: Skaters learn exercises containing edges, turns and field movements. 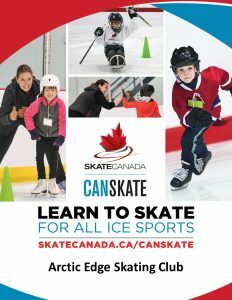 Free Skating: Skaters learn how to execute jumps, to spin in a variety of positions and to incorporate those and other skills into a program of a specified length using connecting steps and music interpretation. Interpretive: Encourages creativity and movement to music, and allows skaters to explore the performance aspect of skating without focusing on technical elements. There are four different Interpretive levels: Introductory, Bronze, Silver and Gold. Dance: Skaters learn timing, musicality, rhythm, interpretation, and structure as well as basic skating skills such as edges, flow, control and unison. Dancers skate with partners and sometimes by themselves to various musical rhythms, including waltz, tango and blues. Each compulsory dance has a series of steps that must be skated in a specific pattern. In addition to the compulsory dances, there are also Creative Dance tests. 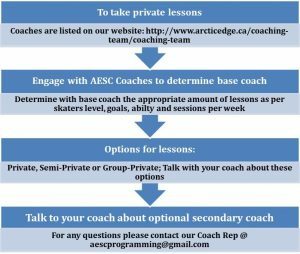 The Arctic Edge Starskate program is separated into three levels depending on the tests passed. Junior Starskate is for skaters new to the program and working on Star 1 and 2. Intermediate Starskate is for skaters who have passed the Star 2 skills and freeskate test. 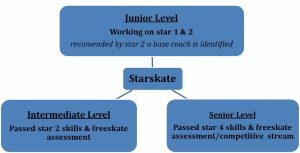 Senior Starskate is for skaters who have passed for Star 4 skills and freeskate test. Bingos are a large source of fundraising revenues for the Club which help pay for coaching and ice fees. Parents/Guardians of skaters who join StarSkate program will be required to work between 6 to 10 bingos throughout the year on Friday evenings between September to September of the following year. The majority of the bingos will be held during May to August. The number of bingos will be determined based on our registration numbers.